It was a season that saw the Clarets eventually finish in 11th place. It was also a season in which the league games both started and ended with a 2-0 win and inbetween brought with it an unexpected change of manager, a brief flirt with the play-off places and a concerning last few weeks when we feared a potential drop into League One. Going back a year, we'd ended the 2011/12 season in 13th place and manager Eddie Howe decided to call time on the Burnley careers of Andre Amougou, Clarke Carlisle and Brian Easton. None of those were a surprise. Carlisle had been out on loan all season, Amougou, who was to revert to Bikey later in the summer, had been frozen out since January and it had previously been reported that Easton wouldn't be considered for the run in to the end of the season as he had no future at the club. Joe Jackson, Shay McCartan, Alex MacDonald and Jon Stewart were all offered new one year deals and the club confirmed they had taken up the options of a second year on the contracts of both Zavon Hines and Chris McCann. By that time we knew that amongst our league opponents for the new season would be local rivals Blackburn and their chickens as well as Bolton and their manager who had vowed to improve their club in each year. Both had suffered relegation from the Premier League . As is always the case, there were early links with players. Mansfield's Luke O'Neill was the first and he was quickly followed by Derby captain Jason Shackell. The summer of 2011 had been spent chasing Shackell, then at Barnsley, and Stoke's Ryan Shotton. Neither came to fruition. We would need new signings and a striker was surely at the top of the list with Jay Rodriguez expected to move on. I don't think anyone expected him to stay and supporters were just hoping we could get something like his worth should a Premier League club come calling. Southampton were the first club to show a real interest and it wasn't long before others were mentioned with Everton seemingly the most likely challengers to the newly promoted south coast club. It didn't take long and on Sunday 10th June the club confirmed that Jay was a Southampton player. 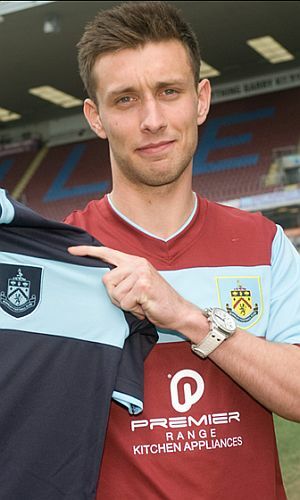 They were the only club to have made an offer; Jay went there straight from a holiday in Mexico to put pen to paper on a four year deal and joined former Clarets Richard Chaplow, Jack Cork and Danny Fox at St. Mary's. Just over a week later the 2012/13 season took a step closer with the release of the fixtures and incredibly they were sending Bolton to us on the opening day. I can confirm that Owen Coyle, who was given the news by a member of the Burnley FC staff, was far from happy with the start his team had in front of them. He knew what was coming. It was now time for our squad strengthening. Three days before the fixture announcement we'd signed O'Neill and as we moved into July, just ahead of pre-season training, he was joined by Leyton Orient winger George Porter. The players reported back for pre-season training on 6th July and 24 hours before the work started we landed our marquee signing. Jason Shackell was finally a Burnley player. The signing of the much travelled central defender was greeted very positively judging from the reaction on the message board and it lifted everyone's confidence that we could be in for a better season. Gianfranco Zola arrived at Watford to replace Sean Dyche who had lost his job after just one year in charge. It was one of a number of managerial changes over the summer but hardly registered with us other than Watford being ready to bring in a bus load of loan players. Back at Burnley the pre-season games got underway. The development squad went first, winning at Mossley but before their second game at Barrow came more transfer news. Howe added Reading left-back Joseph Mills on a season long loan but on the same day we said goodbye to Hines. It had all been a bit strange. When we signed him we announced a two year deal, then revealed the second year was an option we'd taken up. Now, into mid-July we confirmed that the option was not being taken up after all, this after Hines, in an interview with Sky Sports, confirmed he was a free agent. He hadn't started a league game for us since his move from West Ham in August 2011. The development squad lost at Barrow and then it was the turn of the first team. All the new players got half a game at Altrincham as Howe used different teams in each half. We won 4-1 with our goals coming from McCann, Danny Ings and two for Charlie Austin. Supporters noticed that Shackell was wearing the captain's arm band in the first half despite McCann being on the pitch and after the game Howe confirmed that the new signing was to be the new club captain. Ings scored a late goal to earn a 1-0 win at Gigg Lane a few days later but that's where my pre-season, as far as the first team was concerned, came to an end. I opted out of the trip to Bath having not felt too well but I did get myself to Alfreton, Padiham and Droylsden for the development squad games. Down in the South West we won 3-1 at Bath with Keith Treacy, Porter and Ross Wallace getting the goals. Sam Vokes had been signed that day from Wolves and made an appearance as a substitute. Austin (2), Mills and Wallace were the scorers in a 4-0 win at Cheltenham before we headed home and to the last pre-season game at Rochdale. I wasn't feeling at all well by then and wouldn't have even made a game at the Turf let alone endure the journey past Owd Betts. I've since been told I was the lucky one. We were poor with Austin heading home our goal in a 3-1 defeat and days later we made our last summer signing with the acquisition of midfielder Brian Stock from Doncaster. It was one week away from the Capital One Cup game at Port Vale and I wasn't sure whether I'd make it or not. I did in the end. I was feeling a bit better than I had been but was still struggling as I joined friends John and Mikey for the journey down to the Potteries. Port Vale were very much in the pink. Playing in the brightest pink shirts I've seen a team wear, they were in front on nine minutes when Chris Shuker scored. The lead lasted only two minutes. McCann got the equaliser with a header. Austin gave us the lead just before half time when Joe Davis snookered his own goalkeeper for Dean Marney to set up our number nine, and Marney himself got a third just before half time with a good finish. A 3-1 win and a place in round two with a home time against Plymouth. Now, four days away from the real start of the season and the visit of Bolton. I so needed that game of football. By the time I got home I was shattered but I'd enjoyed every bit of the day out. I don't think John or Mikey will ever know just how much I enjoyed their company that day. I was to receive some good news health wise before Saturday. I was feeling a bit stronger and ready for Owen Coyle's second return. The season was about to start.